The alleged Ty Cobb diary purchased by the Hall of Fame from Barry Halper. The diary was included in a group of items that were purchased from collector and New York Yankees minority owner Barry Halper by Major League Baseball. 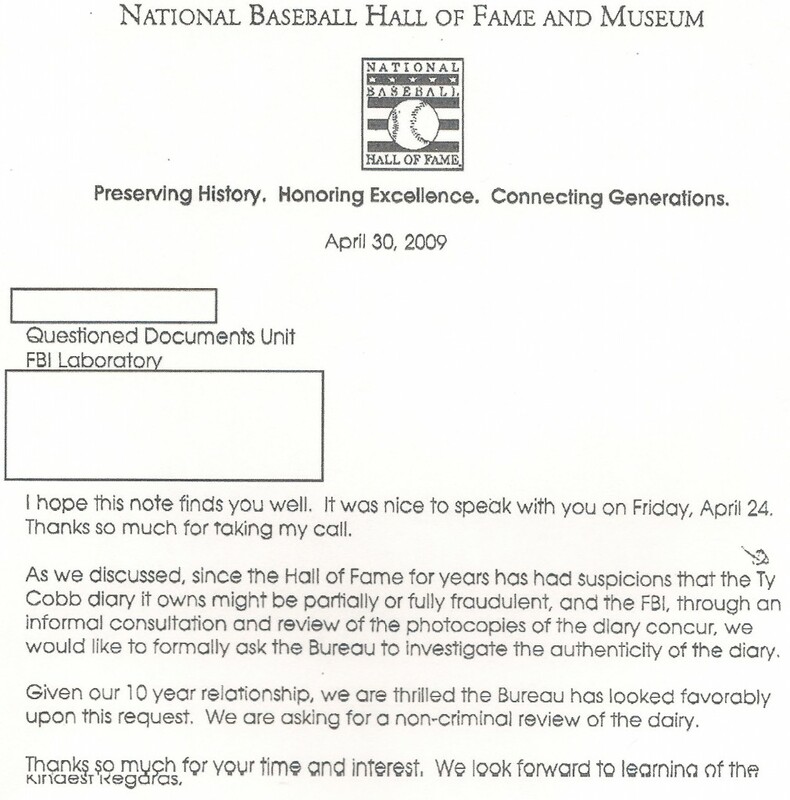 Reports in 1998 indicated that MLB purchased two hundred artifacts from Halper for approximately $7 million and subsequently donated all of those items to the museum in Cooperstown, including the bogus Cobb diary. 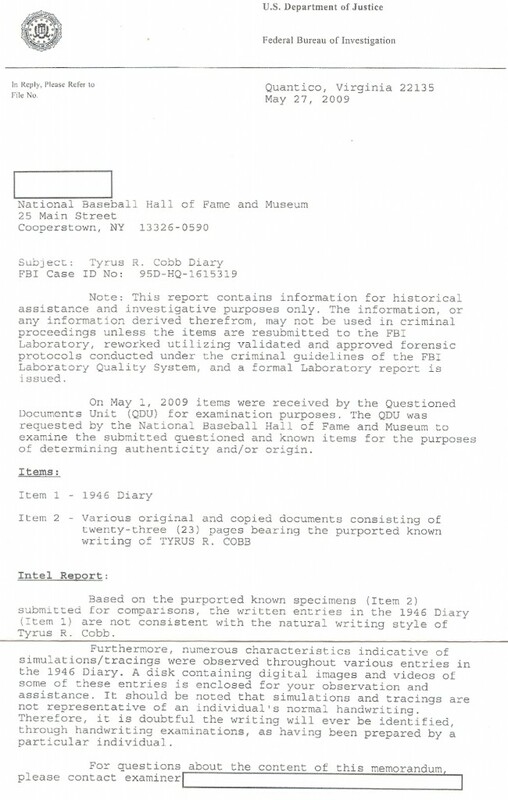 In 2009, the Hall of Fame requested analysis of the alleged Cobb diary by the FBI's Questioned Documents Division. Almost a month later, the FBI’s Questioned Document Unit in Quantico, Virginia, sent the Hall of Fame their report which supported Keurajian’s opinion that the entire diary was a forgery. Haulsofshame.com recently obtained a copy of that FBI report. The FBI issued this report to the Baseball Hall of Fame with their findings that Halper's alleged Cobb diary was not in his hand. Last August Ron Cobb wrote a stellar paper for the Society for American Baseball Research entitled, The Georgia Peach: Stumped by the Storyteller, which answered Harwell’s questions. In his award-winning article Cobb’s investigation illustrated how several items Barry Halper had acquired from Cobb’s biographer, Al Stump, were forgeries. The most blatant was a shotgun alleged to have been used by Cobb’s mother to shoot and kill his father. Researching period police records, Ron Cobb proved that Ty Cobb’s father was actually shot with a pistol. When the Hall of Fame had first choice of approximately 200 artifacts to purchase from Halper before the Sotheby’s sale, the bogus 1946 Cobb diary was chosen by the curators and subsequently displayed prominently in the Hall’s “Barry Halper: Memories of a Lifetime” exhibition. The diary was replicated for visitors so they could turn the pages and read the forged entries, which included references to Cobb’s alcoholism, divorce and a disdain for Babe Ruth. Several other items that were part of the Halper transaction are suspected to be problematic and are currently being investigated by Haulsofshame.com. Suspect items include: Babe Ruth’s polo coat and 500th Home Run ball, Buck Leonard’s Homestead Grays jersey, Cy Young’s 1908 Red Sox jersey and others. Although it was announced by Major League Baseball that they had made the Halper purchase, it was actually the Baseball Hall of Fame that cut the check with funds contributed to the museum by MLB. The Hall of Fame’s 1998 tax return includes an entry noting payment to Barry Halper Enterprises and a fair market value of the collection at $7,068,888. 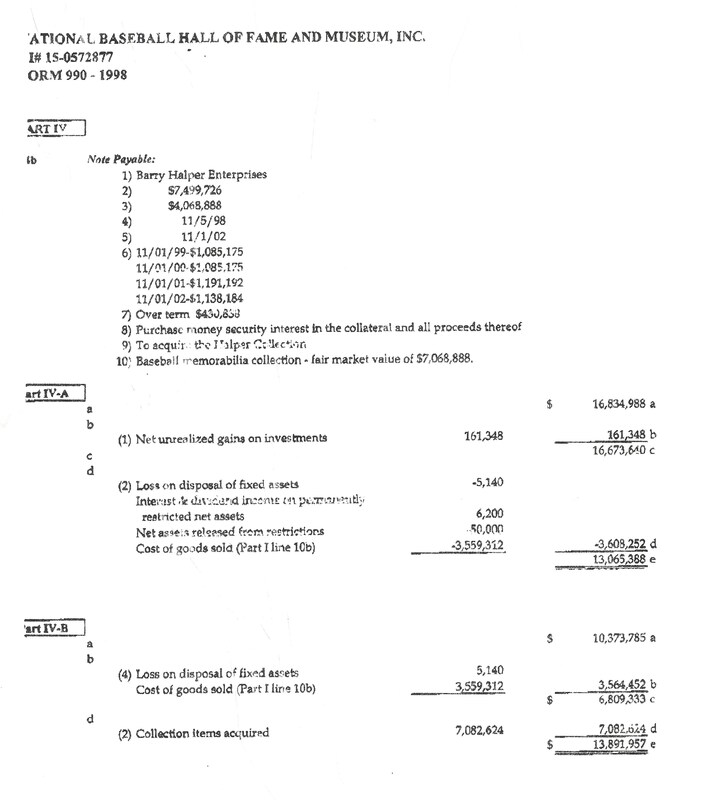 This page from the Baseball Hall of Fame's 1998 tax return states that their purchased Barry Halper Collection had a "fair market value" of $7,068,888. Evidence regarding Halper’s sale to MLB and the Hall of Fame suggests that both parties were the victims of an elaborate fraud totalling over $1 million. Why MLB and the Hall of Fame have not pursued restitution from the Halper estate are unknown. Halper’s widow, Sharon Halper, inherited her husband’s 2% stake in the Yankee limited partnership upon his death in 2005. Baseball Hall of Fame spokesperson, Brad Horn, did not return calls to his Cooperstown office for comment. When asked what the Commisioners office stance was on the Hall of Fame’s apparent refusal to pursue reimbursement from the Halper estate, MLB spokesperson Matt Bourne declined comment. The article so states, who did Halper purchase this from?? Well, I would say,he got hold of a old book and he himself had someone write in it,cause we all know there are people out there that can do just about anything, to make it look real.So in view of my speculations, Halper is the big culprit all along. It has been brought to my attention, that Halper did indeed purchase this and other Cobb items from a Al Stump,but the kicker is,he knew it was no good, but still pursued in selling it, when first of all should of never touched it and when he did,should of not pawnwed off a worthless item for big $ in return. Congrats to Ron Cobb for the well deserved recognition from SaBR and Mcfarland. That tax report is amazing. I am still wondering if those dentures Barry halper had were really Ty Cobb’s. The alleged Cobb dentures were on display at the Ty Cobb Museum but as a result of Ron Cobb’s investigation they have since been removed from public display. I smiled at the part about “non-criminal review of the dairy”. Maybe it took awhile because the FBI sent it to the FDA. I am the curator of the Ty Cobb Museum. The dentures as of this date and this time(7/6/11, 1:18pm) STILL ON DISPLAY. The only reason they would be removed from display is if the owner wished to not have them on loan to the Museum any longer. If that were the case, then and only then, would they be removed from display. Our apologies for stating incorrectly that the Cobb dentures were not now on display. Al Stump was proven by Ron Cobb’s article, The Georgia Peach: Stumped by the Storyteller, to be a forger and liar who produced multiple fake Cobb Diaries, forged hundreds of Cobb letters and signatures, and fabricated a fantastic but untrue story about the shotgun supposedly used in Ty Cobb’s father’s death. Many, if not most, in the memorabilia industry now seriously question the authenticity of all of the artifacts that came to the Halper collection from Al Stump. Does the Ty Cobb Museum have any concerns about the authenticity of the dentures? Would it support a forensic study to determine if the dentures were indeed Ty Cobb’s? Um. If the diary was indeed as old as it was purported to be, wouldn’t it look something other than positively pristine? And did they have such crisp, clean lithography back in 1946?